Disfruta de tres experiencias en una noche con esta visita guiada que combina comida y romance. 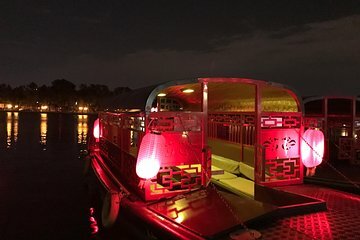 Cene en el restaurante Little Yunnan cerca de la Ciudad Prohibida y luego diríjase al Parque Shica Lak para abordar su barco alquilado. Beba té y disfrute de algunos bocadillos mientras flota en el lago Houhai. Termine la noche con un paseo entre las tiendas exclusivas de Xie Street (Hutong). Disfruta de una noche romántica con cena incluida. I picked this tour for a romantic night out with my wife. It was exactly what I wanted. The restaurant was fantastic, the tour guide Bibi was amazing in every way. Not only was she knowledgeable, she had a great sense of humor, and was a great photographer. The boat ride itself was quite private as there were not too many other boats I think most of the tours happen during the day time. This tour was worth every penny.